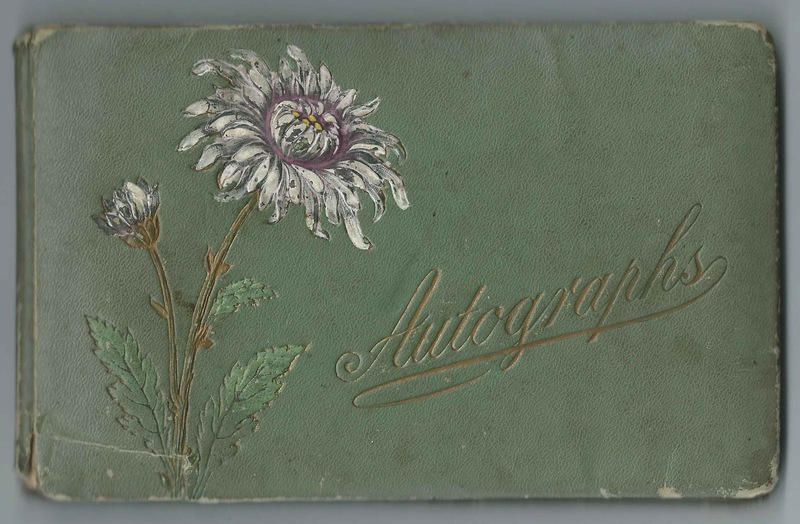 Autograph album kept from 1901 to 1907 by Miss Floy L. Simpson of the Mt. Hope section of Sanford, Maine. During part of that time, Floy was a student at Sanford High School in the Class of 1906. From the page below, it would appear that Floy received the album as a Christmas present in 1901. The album measures approximately 7-3/4" by 5" and contains the sentiments of over 40 of Floy's relatives, friends, schoolmates and teacher. An alphabetical list of the inscribers, together with any personal information they offered, appears at the end of this post. 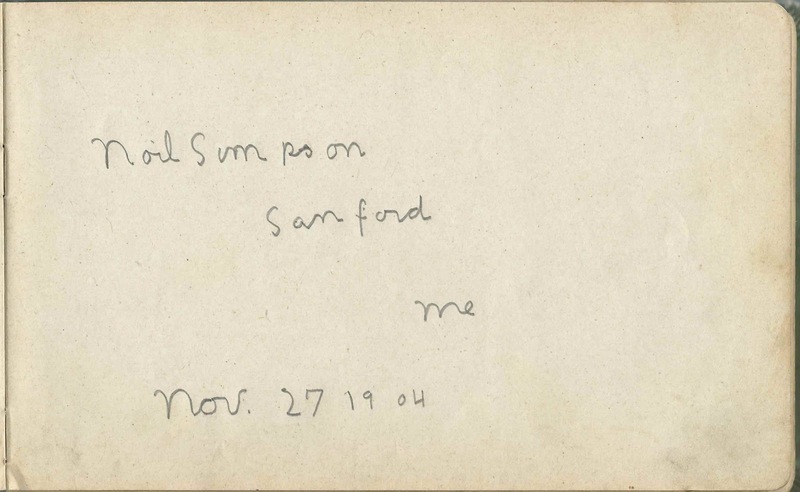 Floy L. Simpson was born June 18, 1888, the daughter of Lewis Almon Simpson and Clara Mabel (Bennett) Simpson. Three of Floy's siblings inscribed pages in her album - 3 pages in the case of brother Noil Howard Simpson, sometimes known as Noel. 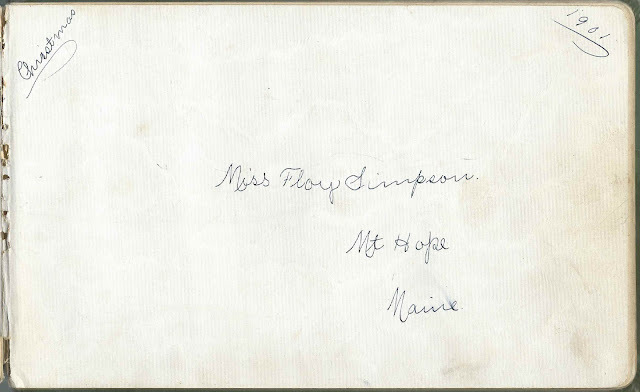 Floy's sister Avis E. Simpson of Mt. 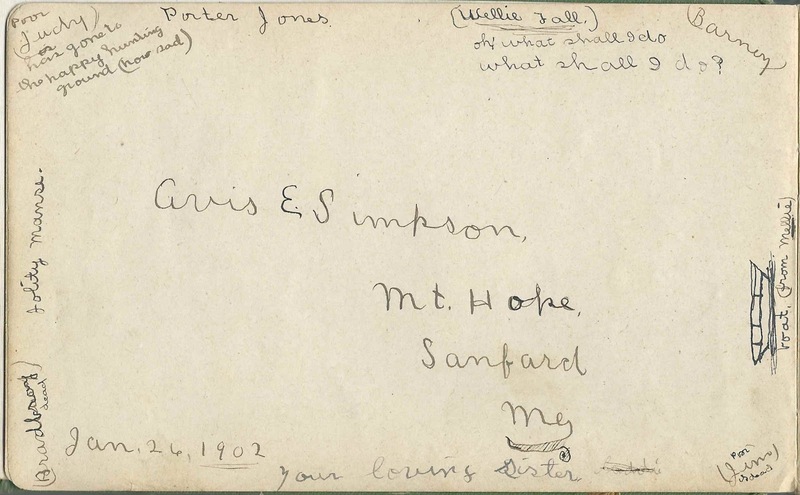 Hope, Sanford, Maine, inscribed a page on January 26, 1902. Floy's brother Ivan W. Simpson of Sanford, Maine, inscribed a page on March 11, 1904. 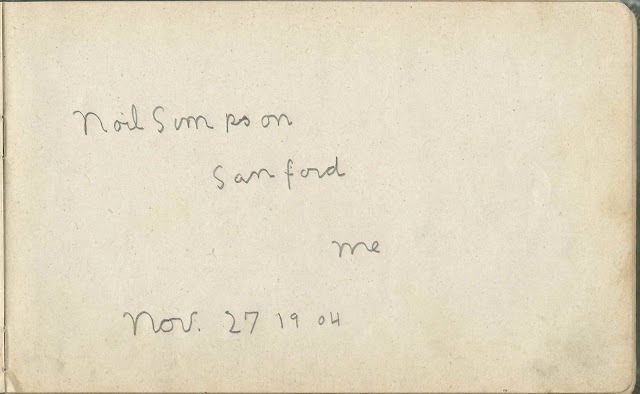 On March 31, 1919 at Sanford, Maine, Floy L. Simpson married Orville Lamont Morrill, son of Nathaniel Morrill and Nancy Jane (Whitten) Merrill. Orville was born March 14, 1893 at Sanford, Maine. Floy and Orville lived at Sanford, Maine, where Orville was a contractor; they had at least one child, a daughter who is buried with them. Floy died in 1969 and Orville in 1977; they're buried in the Evergreen Cemetery at Alfred, Maine. Gertrude J. Annis of Westbrook, Maine; inscribed on August 30, 1903. Gertrude Jennie Annis, whose future husband Raymond Albert Bennett inscribed the right facing page. They married August 1, 1904 at Springvale, Maine.
? Barker of Albany, Maine; inscribed in June 1907. Youngster's handwriting. Given name might begin with "M"; perhaps Merl Barker. Raymond A. Bennett of Rochester, New Hampshire; inscribed on January 26, 1902 [or 1909]. Raymond Albert Bennett, whose future wife, Gertrude Jennie Annis, inscribed the left facing page. They married August 1, 1904 at Springvale, Maine. P. Fanning; the word "Maple" is written at lower left - perhaps a village or other place designation. W. O. Hersey of Pembroke, Maine; inscribed at Sanford, Maine, on May 29, 1903. Floy's teacher. William Osmar Hersey (1867-1948), graduate of Boston Latin and Bowdoin College; taught in various places in Maine; ended his career in education at Portland, Maine. 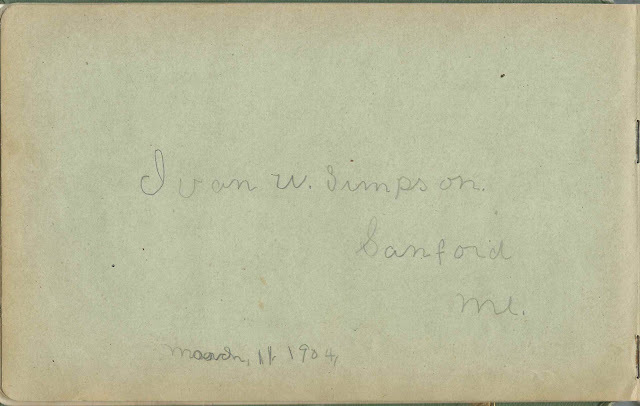 Ivan W. Simpson of Sanford, Maine; inscribed on March 11, 1904. Floy's brother. 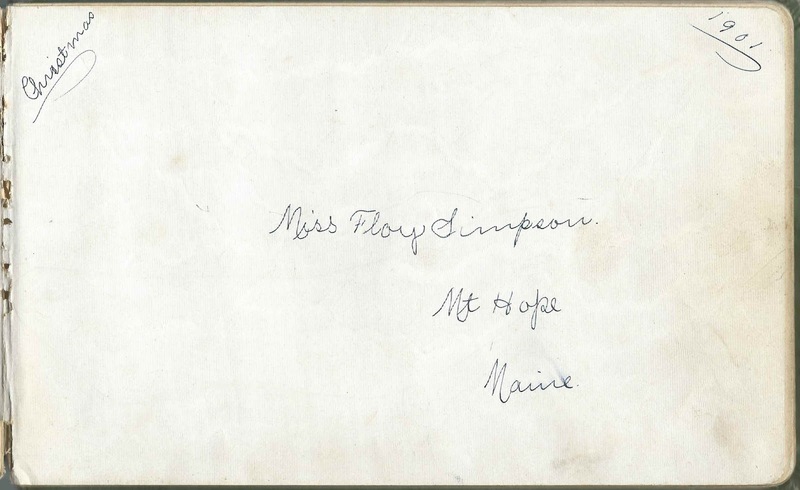 Noil H. Simpson of Sanford, Maine; Floy's brother, inscribed his name in three places, one of them dated November 27, 1904. Laurence J. Young; inscribed on November 9, 1903. 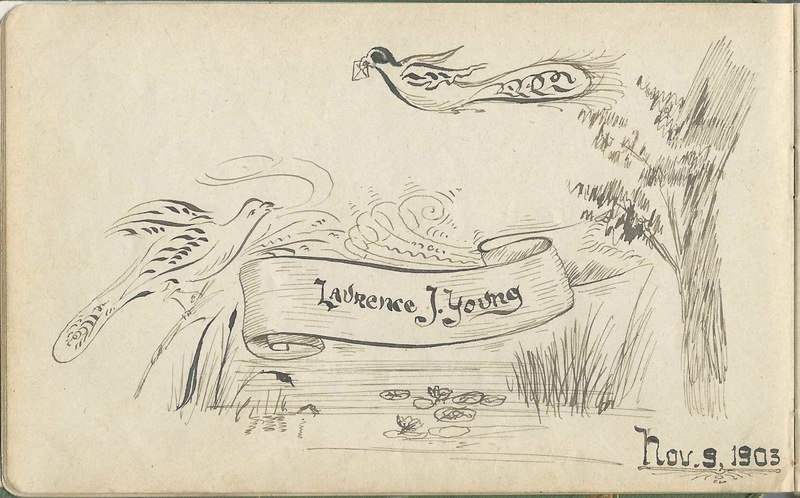 He sketched an intricate design of birds, pond lilies, reeds, waterside vegetation; scroll, etc.